BRIGHTON, Mich. – Earlier this week, we blogged about Ford winning Best Overall Truck Brand, and that is mostly thanks to the all-new, 2015 Ford F-150. The all-new 2015 Ford F-150 has brought an all-new meaning to “built tough” with its groundbreaking use of aluminum. 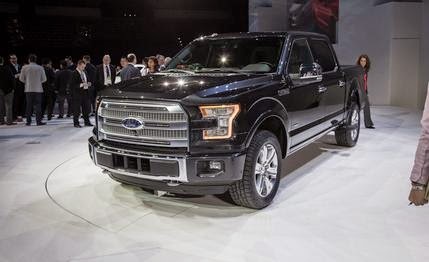 The 2015 Ford F-150 changes the truck industry, and has moved to using a high strength, military-grade aluminum alloy in the body structure of the vehicle, which is a MAJOR innovation for a high volume product such as the F-150. This use of aluminum trims over 700 pounds off of the F-150, which translates to a higher capability of the truck and is noticeable AS soon as one starts to drive it. Along with a new body composition, the F-150 gains another EcoBoost engine, which provides drivers with the combination of horsepower, torque, and fuel-efficiency every truck owner yearns for. The all new 2015 F-150 changes the truck industry, and is truly prepared for anything that the road brings, and that includes unfortunate incidents; “We’ve already been able to optimize the reparability of the truck and offer sectioning procedures and partial replacement procedure that we couldn’t do with the steel vehicle.” Says Larry Coan, Damageability Product Concern Engineer, Ford Motor Company. This transition from steel to aluminum is truly groundbreaking within the automotive industry. This transition also provides the opportunity to add multiple onboard technologies that really set this truck apart from the rest of the pack. These include: a BLIS system, cross-traffic alert, and lane departure warning, just to name a few! Some of these have never even BEEN in a truck model before! Ford is truly innovating the industry! To test drive any of our F-150, F-250, or F-350 models, feel free to stop by! We are located at 8240 Grand River Ave. just north of I-96 in Brighton. We are a family owned and operated business that strives for customer satisfaction. For more information on Brighton Ford visit BrightonFord.com or give us a call at (800) 836-7417.